The uninformed claims by Greg Hunt that it’s better to burn forest waste or it will only turn to methane is very disconcerting to hear coming from Australia’s Environment Minister. Methane is produced in low oxygen, underground or underwater environs like swamps; hardly ever in forests. Forests in fact capture and store huge amounts of carbon and turn ground litter to humus and soil. The Federal Govt wants to allow the burning of forests to be termed ‘renewable’ and thereby claim assistance. Renewable Energy Certificates should only be used to help true renewables like solar and wind. Looking for ways to burn rubbish or trees to ‘green-wash’ power generators and keep the logging industry running is a backward step. The forest ‘waste’ argument was lost years ago when we were told woodchipping was only mopping up unwanted trees and branches. It has been responsible for up to 90% of all logs that come from our forests. Now we have governments and authorities promising hundreds of thousands of tonnes of sawlogging waste at a time when the native forest logging for saw logs, is fast being displaced by plantation wood. So is this really going to be just ‘waste’ or will it drive forest destruction? This is something we should all be very cautious about. Our political representatives should remain sceptical of the ‘methane’ style of claims – Just because they repeat their lines endlessly, does not make them true. Novelist David Arnault of Mirboo North has been producing a weekly Climate Change Newsletter for more than a year. The newsletter examines and comments on various aspects of global warming. Is the Bioenergy Forum being held in the Valley today and tomorrow seeking real solutions to the momentous problems of climate change and sustainability or is it an attempt to rescue the timber industry and the Latrobe Valley generators from oblivion? 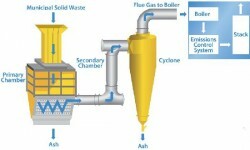 Two crucial questions that follow on from this are where the feedstock for the process comes from and how it is used. If the proposal is that the material to be used comes from our forests and is then burned along with coal in the Latrobe Valley generators then this is disastrous. More CO2 will be released into the atmosphere than saved by these methods. Further by burning forest waste in the generators the life of these monoliths – already past their ‘use-by’ dates – will be extended when they should be closed as soon as is practical. Is the clause in the Renewable Energy Target Amendment currently before the Senate an excuse to prop up an ailing timber industry as well? If on the other hand the material used is true shire and farm waste and is combusted in specially designed generators by the pyrolysis process, then this is a step in the right direction. In the 2010 election I stood as a candidate in Morwell and promoted this process which has been advocated by Tim Flannery. In 2014 I emphasised the need to rapidly phase out timber milling and the need to protect our forests as a carbon store. The pyrolysis process offers the opportunity to produce electricity or liquid fuel from true waste as well as producing a bi-product known as ‘biochar’ or ‘agrichar’. But if the term ‘bioenergy’ used to justify the destruction of the carbon store in our native forests and send the ailing timber industry a lifeline then the process is not sustainable and the energy is definitely not renewable. The Senate amendment should be opposed. Following the surprise announcement that Alinta will close its Port Augusta generators Environment Victoria has called on the Victorian government to urgently “plan for the orderly retirement of coal-fired power stations” in the Latrobe Valley. Recently an accident at one of the Port Augusta power stations meant that the South Australian grid functioned quite well without any coal fired generation – operating on wind, solar and gas. Environment Victoria Safe Climate campaigner Nick Aberle said: “With Alcoa also recently announcing the unexpected closure of its Anglesea Power Station, it is clear that the Victorian government needs to fast-track preparations for how and when other coal generators will shut down. “The profits of coal power stations are being squeezed by increased energy efficiency, more clean renewable energy sources and their own increased maintenance costs for their aging assets. “From a climate perspective, we welcome the closure of these highly polluting power stations…The Victorian government should develop plans for the orderly closure of power stations to ensure that adequate replacement jobs are in place to meet the closure timelines. The Latrobe Valley community is particularly vulnerable to unexpected closures and a clear plan will help Victorian coal workers avoid the same sudden fate as those in Port Augusta. A just transition requires that there is full employment in the Valley and that replacement industry and job opportunities are well established before any closures take place. A jellyfish collected near Duck Arm more than a year ago remains unidentified. The jellyfish discovered by Ross Scott was forwarded to the CSIRO for identification. CSIRO and Australian expert on jellyfish Dr Lisa-ann Gershwin stated that “DNA testing would take place to try and determine where the Gippsland Lakes jellyfish originated from” and that “the jellyfish was in the Sea Nettle group, so was likely to sting.” Dr Gershwin was retrenched before any positive identification was made. Unfortunately Langshaw made no mention of the species gradually extending its range southwards and that this was a result as the warming ocean. All this shows that our knowledge of the lakes, the species they contain, the temperatures and salinity of the waters is strictly limited. Our knowledge of the threats of climate change – of rising sea levels, of acidifying oceans and the migration of species is almost non existent. When will the relevant authorities carry out studies now required for the preservation of this wonderful system? “Having worked in gas plants I know firsthand about the range of constant loud noises that go 24 hours/day; this will upset the grazing and wellbeing of livestock.” Bill said, “I am worried that gas companies will take all the fresh water and we will be left with contaminated water, full of potentially toxic chemicals, it will be impossible to farm; no one will want to live in a gasfield.” Bill has also made another sign a bit further down the highway towards Bairnsdale. 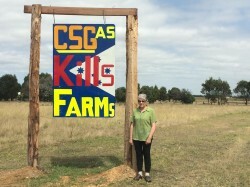 This is a smaller metal sign that says “No CSG”. It is not clear whether it was the moderate winter or the supply of food (they are primarily nectar feeders) that was the vital factor in the colony wintering over. If it is the former then the gradually warming climate indicates that the colony may eventually become a permanent rather than a seasonal one. 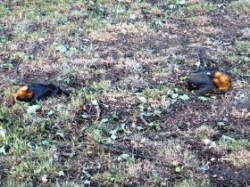 Our source is one of the unlucky landholders on Riverine Street who would like to sell but has been unable to do so because the presence of the flying foxes has severely depressed the property market. However the removal of 10% of the trees they inhabit – about to be carried out by the East Gippsland Shire – may not be a solution if the bats merely relocate further down the river and closer to the CBD. If the winter presence of the flying foxes is not another indicator of climate change then their (and our) vulnerability to heatwaves almost certainly is. The summer of 2013 saw a number of bat fatalities in the Bairnsdale colony during a brief heatwave where temperatures reached 42 C.(see photo). It appears the flying fox is extremely vulnerable to prolonged heatwaves and 42-3C appears to be the critical temperature threshold. Of recent years there have been substantial heatwave fatalities in SE Brisbane, Casino, NSW and other places where fatalities of five to fifty thousand have been estimated. Whilst we wrangle over minor issues like relocation the main issue of climate change is all but ignored. And the current heatwave in India reminds us as a species how vulnerable we are. Groups like the Gippsland Environment Group and environmentalists like Ross Scott and health professionals like Dr. Jo McCubbin have been raising concerns about the mercury levels in fish in the Gippsland Lakes for many years. The release added that the ”study of mercury levels in the fish will be conducted in line with research conducted in 1980, 1998 and 2004, each of which found that mercury levels were well within food safety guidelines and safe to eat.” Whilst this may be so McCubbin and Scott have been pointing out that mercury accumulates in the body and even very small doses may be harmful to pregnant women and small children. The mercury in the Lakes comes from a number of sources including gold recovery operations of the nineteenth century and from the Australian Paper’s Maryvale paper mill. But the major source is probably from the continued combustion of brown coal in the Latrobe Valley. The State government is to be congratulated on this initiative. Pumped hydro energy storage (PHES) is a simple means of storing large amounts of energy. All that is required are two storage ponds with at least 90m altitude difference. When power is cheap and in low demand water is pumped from the low pond to the high one. When power is dear and in high demand the process is reversed producing hydroelectricity. This process is already used in the Snowy Mountains. In an article published online this week Tim Forcey and Roger Dargaville of the Melbourne Energy Institute suggest that the coal pits and storage ponds of the Latrobe Valley are ideal for changing to PHES. The use of already made ponds is a large cost advantage as is the fact that the complete reclamation of the mines would no longer be necessary. This must give the Valley companies some financial incentive for an orderly transition to renewable energy.